Another 1 SPOT Pro first. In the past, if you had a Line 6 or Digitech pedal that required 9VAC (not DC), you had to use their power supply and an extension cord or maybe a courtesy outlet on your power brick, if you could get to it. We put a 9VAC output right on the front panel of the CS12, so you can ditch the big wall-wart and keep things neat and simple. We did have to use a small toroidal transformer for this, as it’s not really feasible to create AC voltage with a switching power supply, but that small toroid is dedicated to just that one output… completely isolated. See DIP switch on bottom of power supply for clearly marked labels. (1) CBAT – (5.5×2.1mm barrel input, Black battery clip output) Connects to battery clip wires inside pedals that do not have DC jacks. Do NOT connect to a battery! 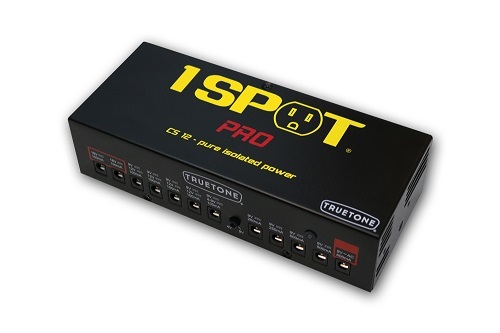 The back panel of the 1 SPOT Pro CS12 has a 2-position 115/230V~ switch that allows the 1 SPOT Pro CS12 to be used in most countries. Warning: Using the unit at the wrong setting will cause damage to both the 1 SPOT Pro CS12, and any effect plugged into output 12. Make sure the switch setting matches the voltage coming out of the wall outlet (+/- 10V~ is OK). This switch only effects the 9VAC output, but it’s important to set it correctly whether you use that output or not… you might want to use it someday. 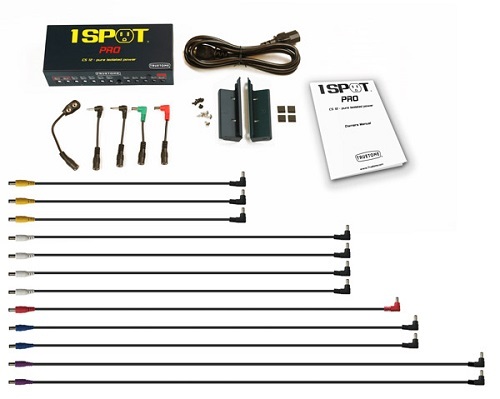 Can the 1 SPOT Pro power my pedal? Which output and settings do I use for my pedals? What is the voltage required by the pedal? Does the pedal require AC or DC voltage? 1. Inspecting the pedal itself near the power jack. 2. Referring to the owner’s manual. 4. If your pedal can be powered by a 9Vdc battery, it can be powered by one of the 9Vdc outputs (exception being the Boss ACA pedals, see below). Some older Boss pedals require 12Vdc, yet can be powered by a 9Vdc battery. They will indicate “Use ACA adaptor” near the power jack. To power an ACA pedal please use outputs 3-6, and set to 12Vdc on the dip switch for the corresponding output. Modern Boss pedals will indicate “PSA,” and can be powered by any of the 1 SPOT Pro CS12’s 9Vdc outputs. Many germanium based fuzzes and Octavia-style pedals will require the use of the CYR adaptor to reverse the polarity to center pin positive. For pedals with high milliamp draws such as Strymon please utilize outputs 8-11. Eventide pedals such as the Time Factor and H9 may be powered by outputs 10-11 with the addition of the CL6 converter for proper dc jack tip size and polarity. 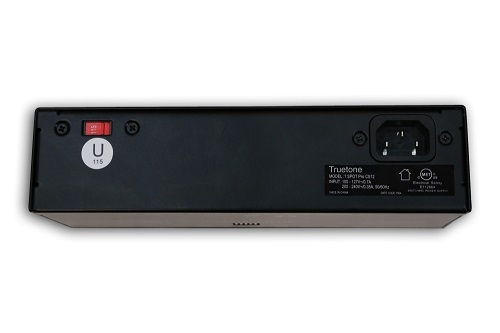 Line 6 M9 may be powered by outputs 10-11, but will also require the CL6 converter. The M9 can also be powered directly by the 9Vac of output 12. Line 6 M5 may be powered by outputs 10-11, NOT output 12. Line 6 modeling pedals (DL-4/MM-4) may be powered by outputs 8-11, but will also require the CL6 converter. You may optionally use output 12, as the power input of these pedals can use 9Vac or 9Vdc. Line 6 Tone Core pedals may be powered by any 9Vdc output. Line 6 POD or M13 cannot be powered by the 1 SPOT Pro CS12, even on the 9Vac output. The milliamp draw is too large for those units. If more 9Vdc pedals need to be powered, a MC5 daisy chain (sold separately) may be plugged into any of the 9Vdc outputs depending on mA draw. Pedals that do not utilize a power jack, yet are powered normally by a 9Vdc battery, may utilize any 9Vdc output, along with the CBAT converter. TC Electronic Nova pedals may be powered by outputs 3-6 in the 12Vdc position. TC Electronic Classic and Tone Print series may be powered by any 9Vdc output. Digitech Whammy: Versions 1-4 may be powered by output 12 (9Vac) Version 5 or Whammy DT may be powered by outputs 10 or 11. Overdrives or fuzzes that sound/feel better at lower voltage should utilize output 7. Set the dip switch to the “on” position, and adjust the mini-pot on the face of the unit to the desired voltage, anywhere from 4-9Vdc. Note: Outputs 1-11 can each handle more than the stated mA number. However, it is important to never exceed the max. current rating of all outputs simultaneously. Dimensions: 8.12” x 3.37” x 2”. 2.35 lbs. (1.06 Kg.) - not including cables or packaging.